We’ve Examined A Lot Of Draft Controls, Some Cost More And Some Less, But The Field Barometric Draft Control Is The Best We’ve Found For Both Operation And Price. This Field unit works to perfection. Others seem to “hang up” at low draft settings, making them essentially inoperative. It stabilizes the draft to any appliance located below the barometric draft control. A counterbalanced flap opens and shuts depending on the strength of the negative pressure (draft) in the chimney. As the flap opens (with greater draft), more air is let into the chimney, thereby decreasing the draft to the appliance. Field Barometric Draft Controls have adjustable weights which allow the units to be set for the particular draft required. They will do an excellent job of maintaining the draft setting within reasonably close tolerances except when the total draft in the chimney drops below the setting on the barometric draft control. The draft control can only decrease draft, it has no ability to increase draft. In cases of excessively strong draft, two barometric controls in series may be required. 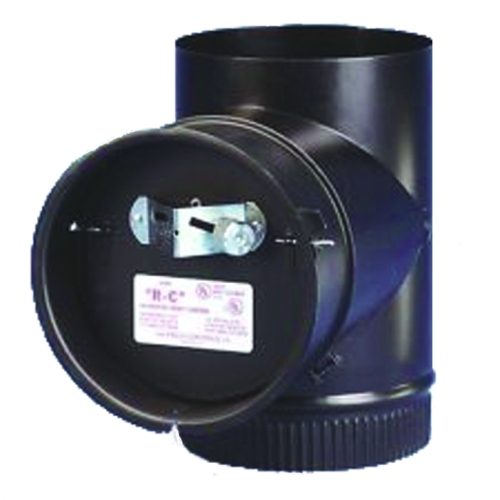 Both coal and wood stoves will benefit from the installation of a barometric draft control. Black 24g. tee with black finish barometric draft control. Note: When used with woodstoves, the connector pipe and flue must be inspected and kept clean. A barometric draft control can potentially lengthen and intensify any chimney fire by allowing an unlimited supply of combustion air.